To the world, you are one person, but to one person, you are the world. 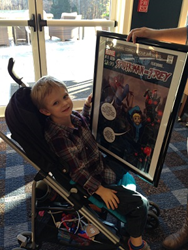 Proteus, which can cause differences in the appearance and growth rate of various body parts, has affected the entire left side of Trey’s body – inside and out. Trey has already endured more than 400 doctor appointments, 16 sedations, nine surgeries, and had both his left leg and left ring finger amputated. In July, he was diagnosed with severe lung disease and is currently waiting to go on the double lung transplant list in Missouri. PeopleStrategy is a leading provider of enterprise Cloud-based HCM solutions that enable employers to more effectively manage their Talent Acquisition, HCM, Payroll, Benefits, Workforce Management and Performance Management processes. PeopleStrategy’s eHCM™ solution suite empowers the entire organization through self-service and mobile access, reducing administrative costs and providing more time to focus on a company’s people strategy. What’s your people strategy? Learn more at @PeopleStrategy or visit us at http://www.peoplestrategy.com.